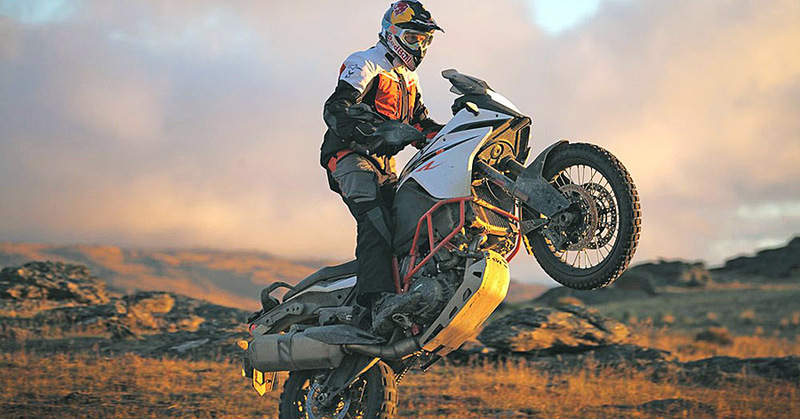 A simple YouTube search is enough to convince anyone that Chris Birch can ride the wheels off KTM’s big adventure bikes. This year, the Austrian company brings its latest 1090 Adventure R to the market, the same bike Birch plans to compete with at the Hellas Rally in Greece. Afterwards, he’ll enter the Iron Class at Red Bull Romanics in Romania where he'll put the 1090R to the ultimate test. Romaniacs separates the riders into classes - Gold, Silver, Bronze, and Iron. Each class takes a different route, and although the Iron competitors race on the the "easiest" course, the route is designed for enduros, not adventure bikes. Birch is used to piloting a KTM 300 2-stroke enduro to compete in the event, a bike that weighs 236lbs less than the 1090R. However, extensive Trials training and a lifetime of competition allow Birch to navigate the big v-twin through terrain some of us wouldn’t dare take our trail bikes. Birch wasn't the only one thinking big, as former BMW factory rider Gerhard Foster plans to ride a Touratech prepped BMW R nine-T prototype. Both bikes will be highly modified to withstand the grueling punishment of "The World's Toughest Hard Enduro". Updated 2019 Honda CB500X with 19/17 Wheels!